The Dallas Cowboys Upper Reserved area includes every section on the top deck of the stadium surrounding the field. The Cowboys Stadium seating chart shows the Cowboys Upper Reserved occupying all but 14 of the 400 level seating areas throughout the facility. Dallas Cowboys Upper Reserved seats make up all of the top level of the 400 seats from 401 to 460 and all but the middle seven sections of the bottom level of the 400 seats. From the bottom level of 400 seats, Upper Reserved sections include 401 to 406; 416 to 439; and 447 to 460. Cowboys Upper Reserved tickets should be seen as a cheap way to get into the venue since the distance from the field and angled perspective make it impossible to follow the action on the field. Since all fans can watch the huge jumbotron dangling above the middle of the field, even the worst seats in the Upper Reserved sections grant a view of the game. Cowboys Upper Reserved tickets cost between $49 to $89 per game depending on section and row when purchased directly from the team. The flat-rate pricing for all games employed by the franchise makes preseason tickets severely overpriced and popular games quickly sold out. Secondary market ticket brokers often sell preseason games for less than $10 while Upper Reserved tickets for a popular, sold out contest often run in excess of $100. 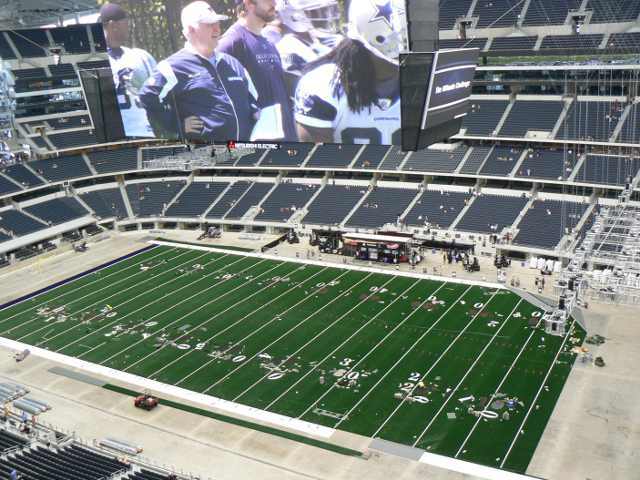 With the enormous capacity of Cowboys Stadium and poor views from most of the Upper Reserved seating location, the cheapest Upper Reserved tickets are often the best option. photo: ambermarie by creative commons license.